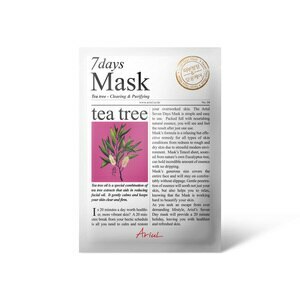 Seven days mask is a quick, effective treatment for various types of skin troubles from acne breakouts, redness, rough or dry skin. It comforts damaged skin from lack of sleep, overwork, UV or other known skin irritants. Its hypoallergenic ingredients along with oil-free minerals and natural elements make it safe for even the most sensitive skin. Tea tree: Clearing and purifying. Tea tree oil is a special combination of tea tree extracts that aids in reducing facial oil. It gently calms and keeps your skin clear and firm. Ingredients: Water, Cetyl Ethylhexanoate, Glycerin, Butylene Glycol, Cyclopentasiloxane, Cyclohexasiloxane, Polysorbate 60, Melaleuca Alternifolia (Tea Tree) Leaf Extract, Arnica Montana Flower Extract, Artemisia Absinthium Extract, Achillea Millefolium Extract, Gentiana Lutea Root Extract, Cetearyl Alcohol, Polyacrylate-13, Polyisobutene, Polysorbate 20, Carbomer, Tromethamine, 1,2-Hexanediol, Propanediol, Caprylyl Glycol, Illicium Verum (Anise) Fruit Extract, Chlorphenesin, Phenoxyethanol, Disodium EDTA, Fragrance.